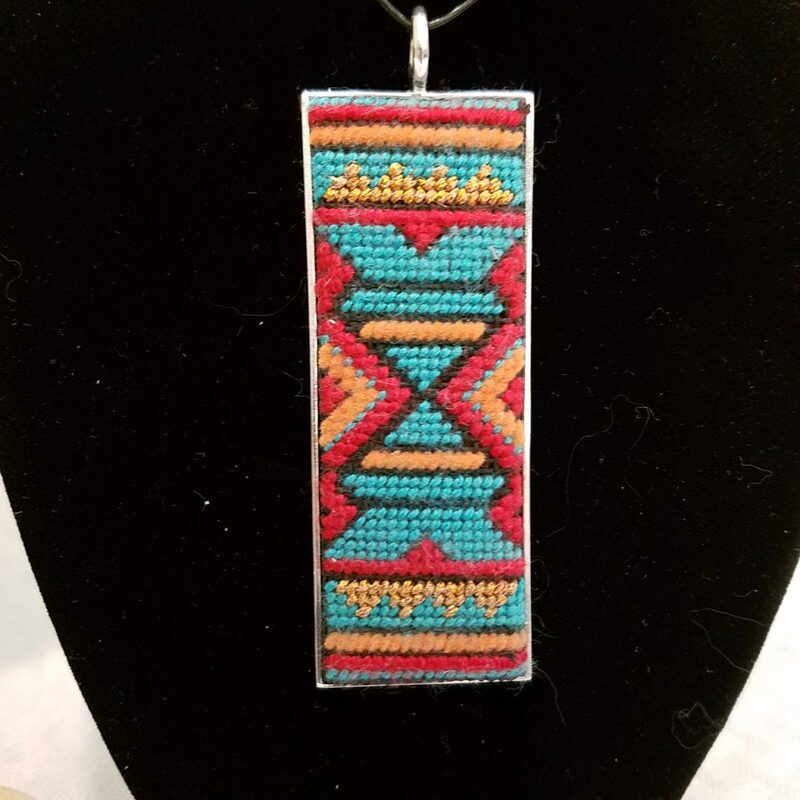 New details on upcoming needlepoint projects in Denver! 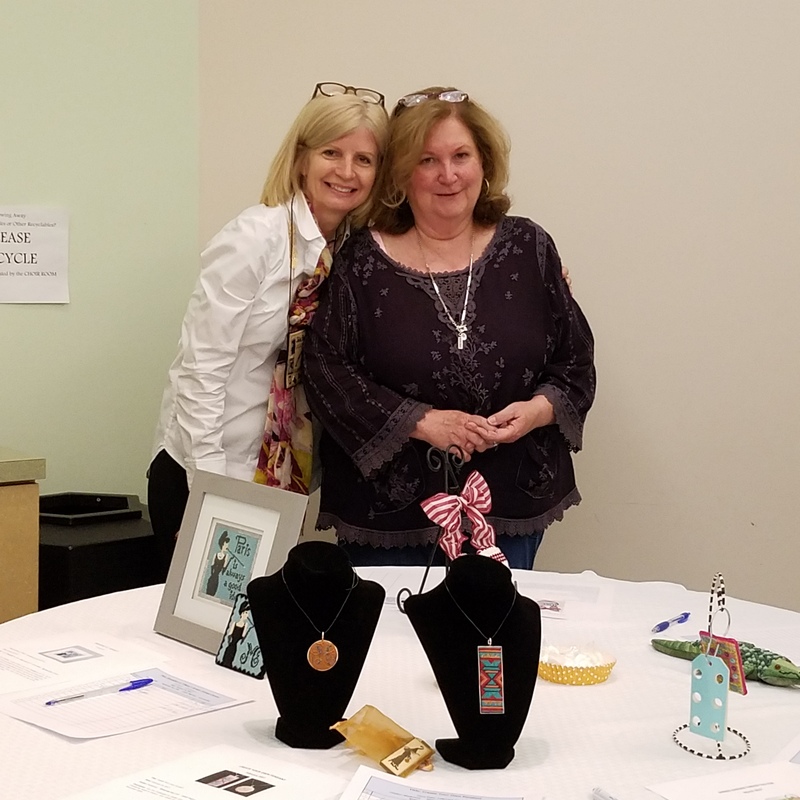 Signups end in November for Colorado Columbine Chapter’s February 21st class on Creating Your Own Pendant! Description: You are challenged to design your own jewelry pendant. Your threads, your design – your creation! Each silver-overlay pendant is created by hand in Mexico. Your choice of round or rectangle. Materials include pendant, cord with clasp, canvas and graph paper to chart your design. Use your own ideas or adapt an existing pattern. Examples shown are an embellished initial and an adaptation of a Native American design. Later we can display our creations and have fun choosing the group’s favorite! 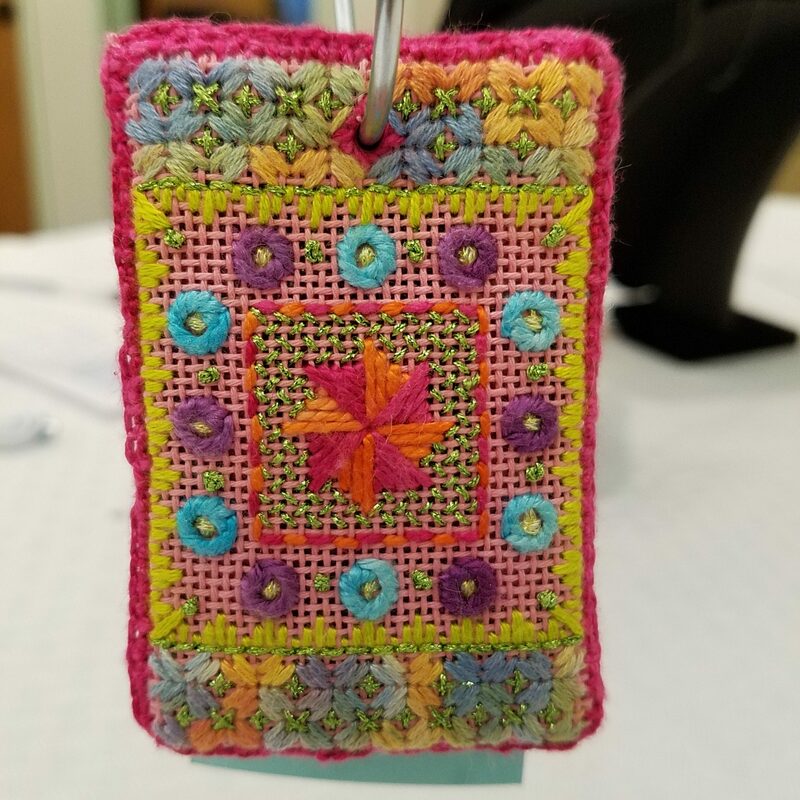 March – Spring Garden Floss Tag Class. Instructor: Madonna. May – “Al E. Gator” Frame Weight on Line-Drawn Canvas. 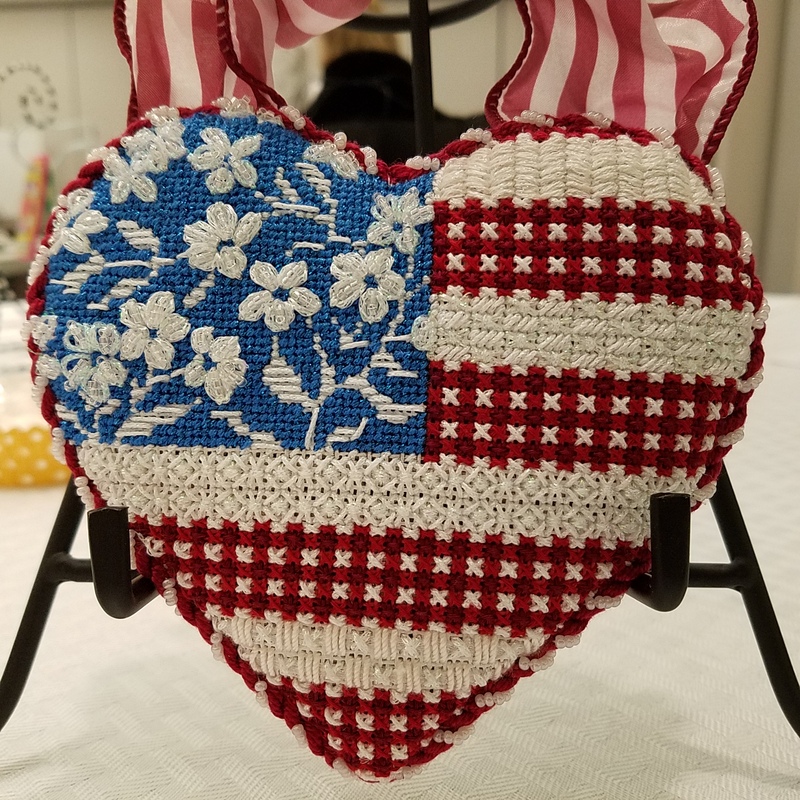 Instructor: Gretchen W.
June – Kirk & Bradley Floral Heart Flag Painted Canvas. Instructor: Vickie. It’s a little jewel of a needlepoint piece, a design called ‘Excalibur,’ by renowned artist and needlepoint designer Tony Minieri, to be presented as the October class for Colorado Columbine Chapter of the American Needlepoint Guild. 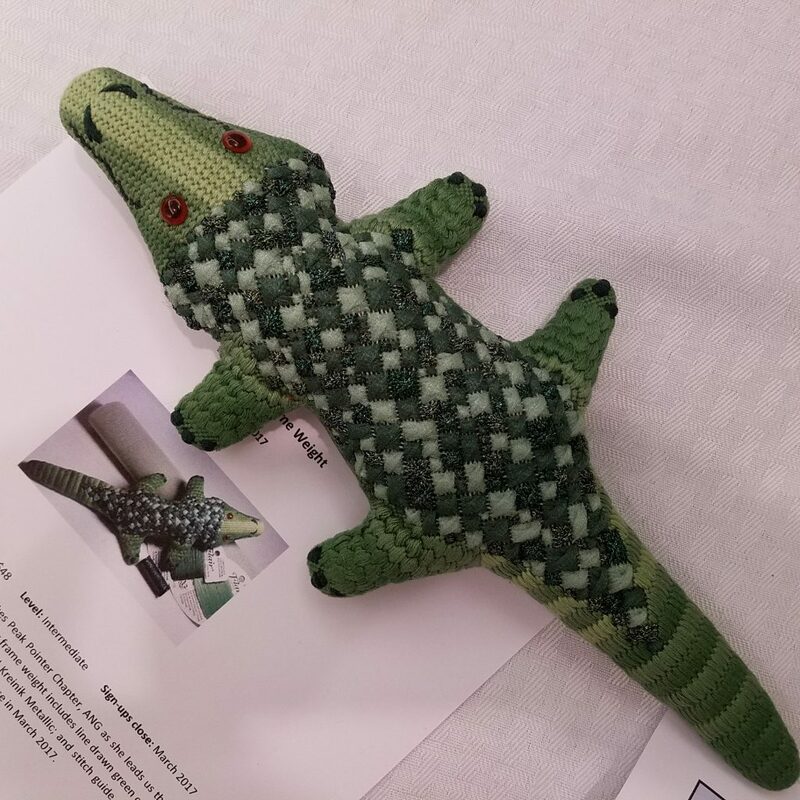 See it at the regular meeting on September 19.
if you’d still like to have the pattern for this piece. 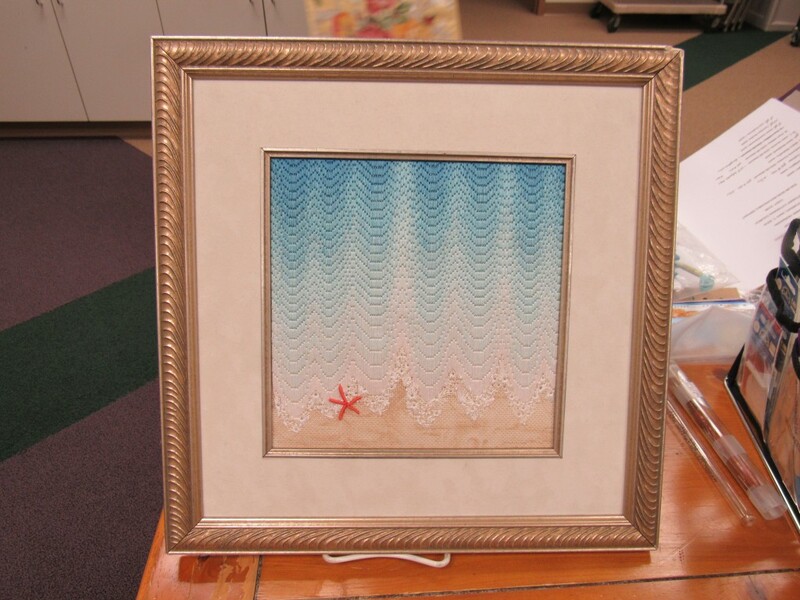 Description: We will be stitching a screen printed canvas from Needlepoint for Fun. The kit provides the canvas, most threads (threads for lettering not included) and stitch guide. This canvas can be printed simplistically as a coaster (beginner level) or as the canvas shown in the photo (intermediate level). 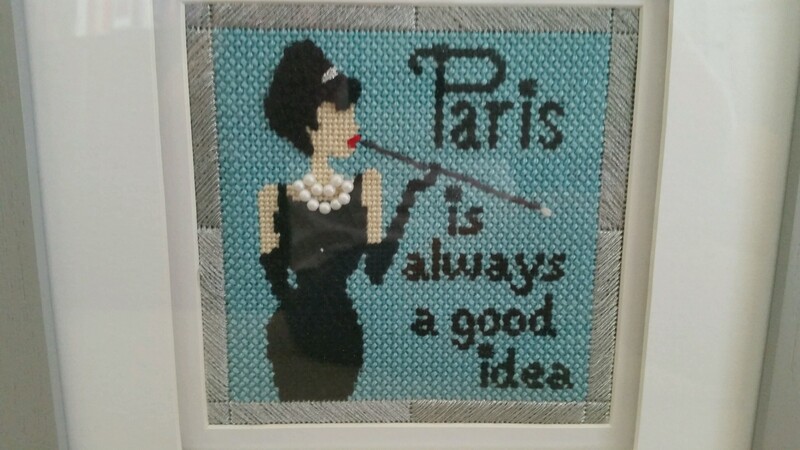 The lettering was added to the screen printed canvas for added appeal, since in the words of Katherine Hepburn, “If you obey all the rules, you miss all the fun”! Sign-ups are in progress and close in October 2016. February – Custom Pendant Class. Instructor: Madonna. 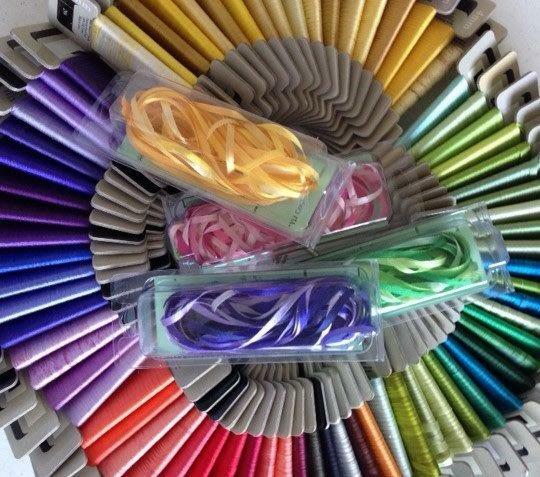 Denver needlepointers, get your ribbons on in September! Description: Learn everything you’ll need to know to begin embellishing your canvas with silk ribbon. 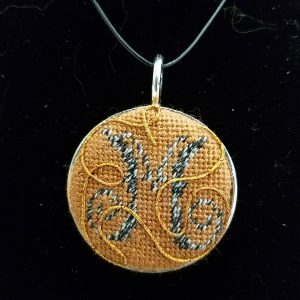 Covering the basics for getting started, this “silk ribbon 101” program will include how to thread up, start and end a stitch, learn basic stitches and many good-to-know hints along the way. Participants will receive instructions and materials, see basic stitches demonstrated and have an opportunity to practice on their own. Sign up for this program at the June and July chapter meetings. 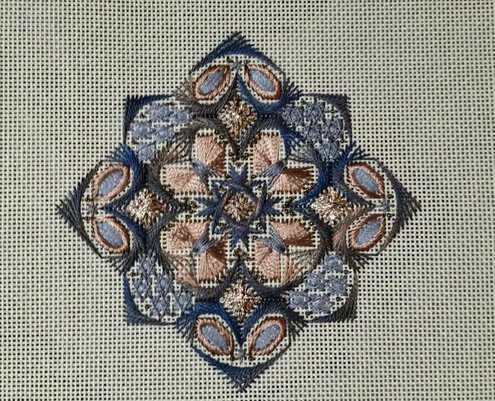 Denver’s fastest growing needlepoint group, the Colorado Columbine Chapter of the American Needlepoint Guild, will hold its June meeting on the 20th. 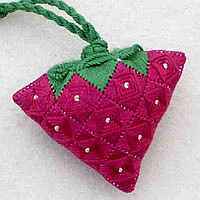 A class on how to stitch a strawberry scissors fob is planned. The design uses beautiful threads in hot pink and bright green: Kreinik Silk Mori and Silk Serica. 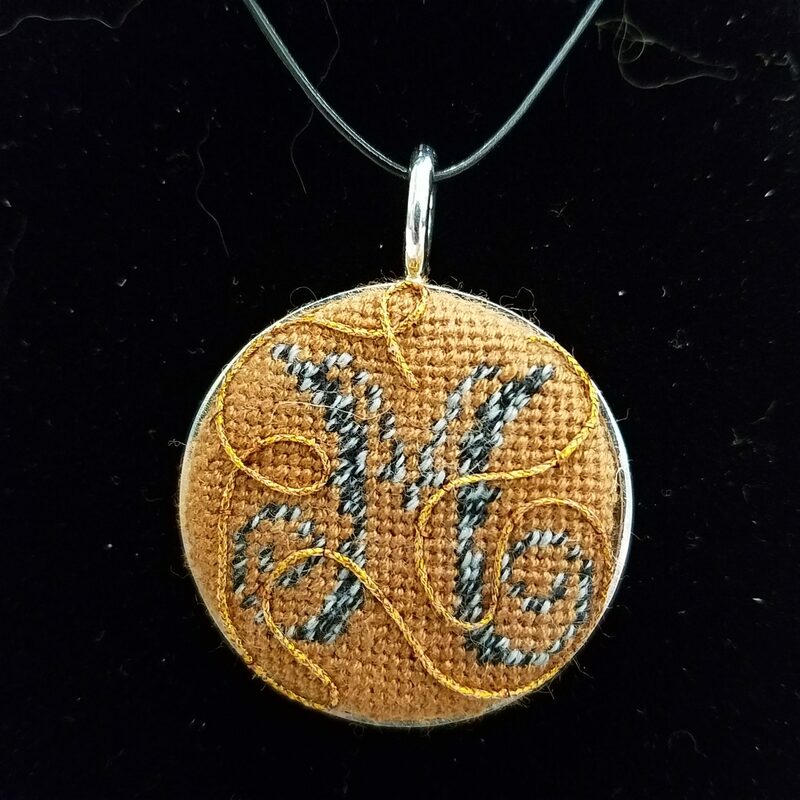 Our July, 2016 meeting will be open stitching and finishing a Kurdy Biggs piece many members began in our recent workshop. 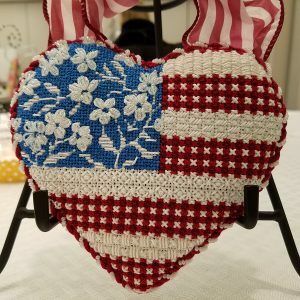 Join us for monthly meetings and lots of needlepoint chat and stitching! 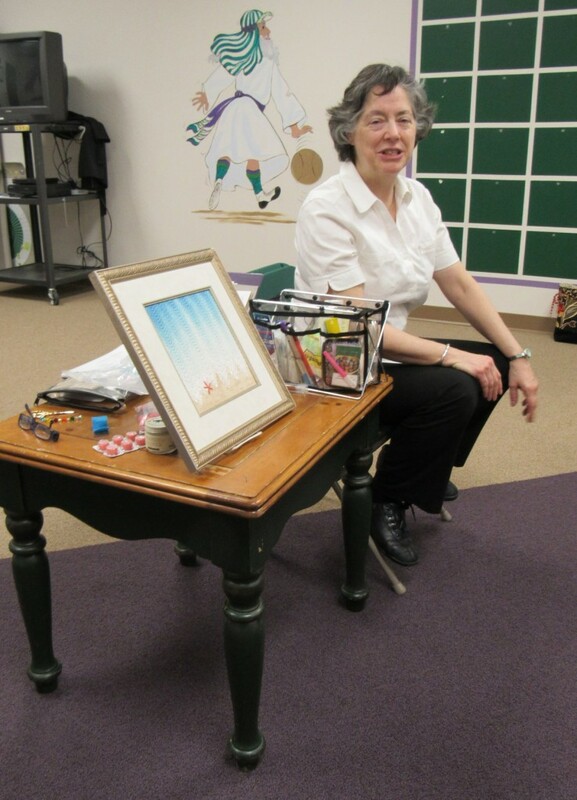 Diane’s beautiful design class drew many chapter members and stitchers from other area groups via the Denver Needlework Consortium.